Google has opened a new 100 desk office in Melbourne, but the company is sticking with Sydney as the location of its headquarters, despite the trouble it is facing finding a bigger home there. The new digs in Collins Street, in Melbourne’s CBD, comes complete with “uniquely Melbourne features, including a graffiti wall” and workspaces named after local landmarks such as The ‘G, Flinders Street and the Yarra Valley. There’s also an auditorium of sorts, built on a set of wooden stairs, and a wall of moss. 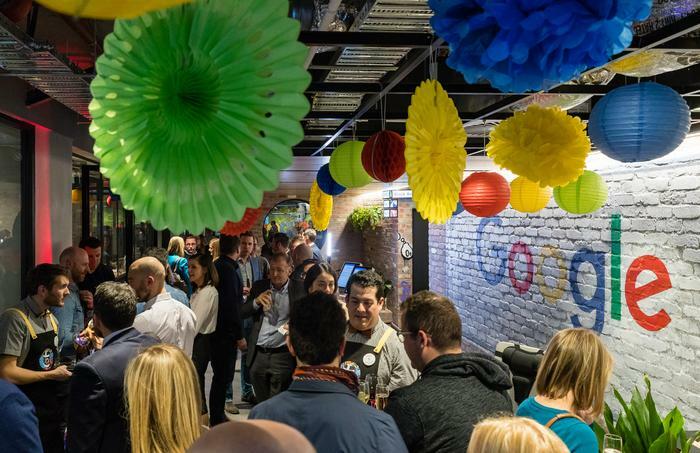 The office – which is currently only half filled – was officially opened last night by Victorian Minister for Small Business; Innovation and the Digital Economy; Trade and Investment, Philip Dalidakis MP, with the words: “OK Google, open the Google Melbourne office”. Google has grown quickly in Melbourne, beginning with a team of just four a few years ago. “The new Melbourne office demonstrates our long-term commitment to businesses and partners in Victoria. We’re growing because our partners – local businesses and community groups – are growing,” said Google Melbourne site lead Sean McDonell. McDonell reportedly ruled out Melbourne becoming the company’s new engineering hub and headquarters however. In April, Google suffered a setback in its bid to find a bigger home in Sydney, after the NSW state government knocked back a plan by developer Mirvac to establish a tech hub on land next to Carriageworks in Eveleigh. Google was to be an anchor tenant in the precinct, but the plan failed to pass a “uniqueness test” set by the NSW cabinet’s infrastructure committee. Last year, the company pulled out of plans to set-up shop at an overhauled White Bay power station in Rozelle due to lack of public transport upgrades and the prospect of spending years in the midst of a construction site. The delays have seen a number of states and local councils make appeals to Google and its nearly 1,400 Sydney staff to move elsewhere, including Wollongong and the Sunshine Coast. Former managing director for Google Australia and New Zealand Jason Pellegrino, who lives in Wollongong, told the Sydney Morning Herald that “at this stage we are focused on Sydney”. Earlier this week it was announced Pellegrino would be departing the company to take the chief executive officer role at Domain. Google is just one of a number of major global tech companies investing in Melbourne, including Alibaba, Amazon, JD.com, LiveTiles, Mimecast, Slack, Zendesk and Square. These companies have been attracted by Victoria’s healthy investment climate and strong economy as well as its wealth of tech talent and vibrant tech ecosystem, said Dalidakis. “We’re working hard to retain our number one tech city ranking in Australia – we believe Google has both a bright future here and a strong part to play in delivering strong job growth,” he said. See a slideshow of images of the new office here.